"Old Mrs. Rabbit was a widow; she earned her living by knitting rabbit-wool mittens and muffatees (I once bought a pair at a bazaar). She also sold herbs, and rosemary tea, and rabbit-tobacco (which is what we call lavender)." I suppose that as one blogs, layers of skin are slowly removed and people get to see how weird you are! Truth be known, I am weird. To be in my (early!) 40's and still enjoy playing in the world of Beatrix Potter! Perhaps it is because there is so much disturbing things going on today and it can be therapeutic to ponder and dwell on the "good things". Every spring, my heart falls in love (all over again) with the innocent world of rabbits, ducks and geese that Beatrix Potter created. Being a very theme-oriented person, I find it fun to prepare little projects of my own based on her books. It seems Mrs. Rabbit had her hand in much industry and we never know what she is going to share with us! But this I do know, it will be "baskets" of fun! Herbal remedies, printables, children's activities, homemaking DIY's and so forth will be posted every Friday during spring (if our schedule allows). We will deem it "Fun Friday" in this little web-world of ours. What about you, are you still delighted by the sweet stories of childhood? This post may be shared with some or all of the following link-ups: The Art of Home-Making Mondays, Modest Mom Monday's, Monday's Musings, Make Your Home Sing Monday, Good Morning Mondays, The Scoop, Titus 2sdays, Titus 2 Tuesdays, Roses of Inspiration, Tuesdays with a Twist, Raising Homemakers, Wise Woman Link Up, Homestead Blog Hop, Wow Us Wednesdays, Coffee and Conversation, Homemaking Thursdays, Home Sweet Home, Our Simple Homestead, From the Farm Blog Hop, Front Porch Friday Blog Hop, Awesome Life Friday Link Up, Five Star Frou Frou Friday, Simply Natural Saturdays and Clever Chicks Blog Hop. Thank you lovely ladies for hosting these. Thank you lovely ladies for hosting these. All illustrations by Beatrix Potter. How lovely. I'm looking forward to Fun Fridays. What a very sweet place this is to visit. We have two wild rabbits living in our garden at the moment. So cute to see them frolic very early in the morning just a the sun is peeking over the hills. Ah... Thanks for sharing your love for literature! I am not the only "weird one" I guess :) I do appreciate your interest! Oh, I can't wait to see what you have in store for us! I loved Peter Rabbit growing up. Not weird~ I wasn't introduced to Mrs. Potter until I was an adult & was instantly captivated. I might have heard Peter rabbit once as a child, but if so, it was only by chance. Even as an adult, she seems to bring back fond memories of how we thought as a child. Different animals do have character, and she put into words what we were still thinking as children a century later. I can hardly wait to see what you come up with on Friday. Dear JES, thank you for baring your heart to us in this way. I'm a lover of Beatrix Potter's books as well. Those and the Little House series are a sweet "escape" from the serious issues of the day! As always, looking forward to your posts. Best wishes to you and your family! I too love the innocence of these children books. They are so sweet and I don't think it strange to love them at all. I can't wait to see what you have in store. Thank you Amy Jo, I think you summed it up with innocence. That is something I crave for our children in this disturbing culture. Have a wonderful week! I love Beatrix Potter! When my children were younger we did a whole unit of study on her books one year and found the loveliest illustrated biography about her in the library. I've wanted my own pet hedgehog ever since reading it. :) I'm looking forward to your projects! I love Mrs. Tiggy-Winkle too :) Thanks for sharing Jan! I look forward to this. I love Beatrix Potter. I also want to share with you how am so thankful the Lord led me to your blog. It was by chance and I am thankful I have found a great place to visit. Thank you for sharing and the kind encouragement Chrissy! Hi JES... 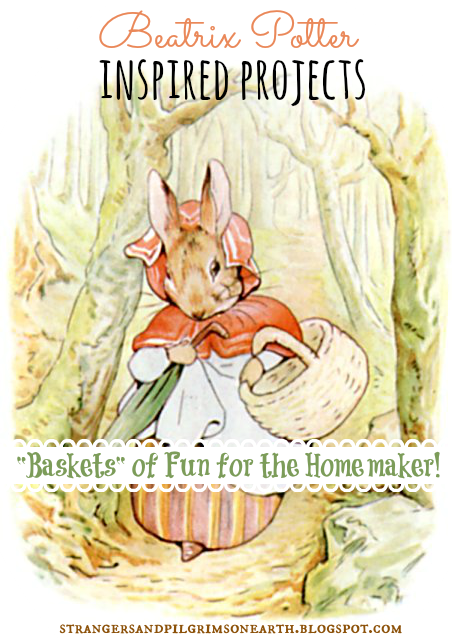 This post reminds me of the artist Susan Branch's interest in Beatrix Potter and her books. She often blogs about her also. Wanted to send her a head's up about your post but I will let you choose to do that or not! She has a sweet little collection of the characters (porcelain) sitting on her kitchen window sill year-round. I look forward to your fun Friday blogs... Thank you! Hi I just wanted to say, "Thank you." I didn't know Susan Branch had a blog. Her books are wonderful. I will look for the blog. Yay! I am so excited for "Fun Friday". I too love Beatrix Potter and love doing activities to along with story time, you always have such fun ideas to along with some of my favorite stories. Thanks for your inspiration! I loved this post - especially because it confirms that there are many other 'weird' people just like me :o) I'm nearly 40 and still love Beatrix Potter, Brambly Hedge and a host of others! Looking forward to your Fun Friday posts. Another reader thought of the same thing! Thank you! :) Sometimes it takes another set of fresh eyes! P.S. Sounds like a fun project, thank you for sharing! I am sure they will love them! 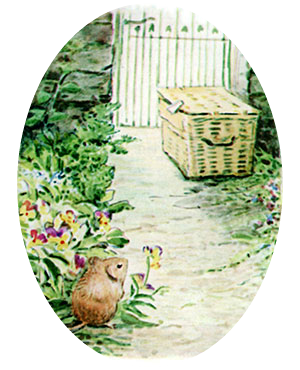 I am half-a-century-plus old and I still enjoy the world of Beatrix Potter. Maybe more so than when I was young! I found this little series at the All Things Spring Link Up. Thank you for sharing. I'm enjoying it very much! Happy Spring to you! your site is amazing. love all of the peter rabbit posts. thank you so much. my daughter is in love with peter rabbit right now and all of these activities are perfect! Guess some part of me refuses to grow up but so enjoy just seeing the illustrations. Also have been follower of Little House stories when we still had satellite tv. Got sick of all the junk was paying for, never watching and gave Dish network heave ho couple years ago. Don't miss it at all. So grateful there are people like yourself that remind us of good things, good ideas. Am older, (will be 76 in July), but think kids need innocence in their lives, we have to live with unpleasant things soon enuf in life. So glad to have found you thru our dear Australian friend Kerrianne. I am so enamored of her and her blog, she is such a gem. Have subscribed to your blog, look forward to more innocence. Oh my! This look like a wonderful list of things! Thank you for sharing!!!! Oh.........my....gosh! I'm 52 and I've kept hidden my love of Beatrix Potter's world of rabbits and all things wonderful. I watch the cartoons when no one's looking! I daydream of being a part of the simplicity of it. So either you're not weird OR you have company sister. Either way, thank you for this post and all that goes with it! I'm smitten with Tasha Tudor and her work/life as well. P.S. Any one else get in here and get so excited that you don't know what to look at next because it's ALL SO GOOD??????? Yeah, me too!